Active Sound Studio is "2-in-1" product suite, intended for the Professional and Enterprise developer, contains the following controls:1. Active Sound Recorder: adds sound recording, sound analysis and CD ripping to multimedia applications; 2. 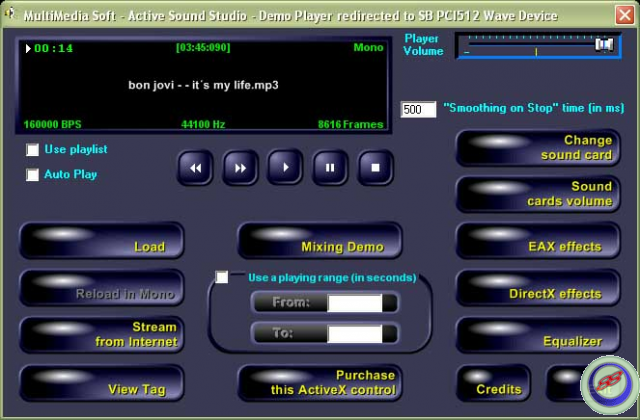 Active Sound Editor: adds sounds editing and sound analysis capabilities to multimedia applications. ...... The integrated Sound Activation System allows pausing a recording session automatically when no sound is being heard. Can obtain CDDB information about a CD album during a ripping session. - Active Sound Editor: adds sounds editing and sound analysis capabilities to multimedia applications. It can perform various operations with audio data such as analyzing the sound's waveform at different resolutions with rich visualization capabilities like zooming and panning, filtering, applying audio effects like DMO, VST, Equalizer, Tempo change, custom DSP, sliding volume, volume automation. Supports encoding in several audio formats. Qweas is providing links to Active Sound Studio 2011 as a courtesy, and makes no representations regarding Active Sound Studio or any other applications or any information related thereto. Any questions, complaints or claims regarding this application Active Sound Studio 2011 must be directed to the appropriate software vendor. You may click the publisher link of Active Sound Studio on the top of this page to get more details about the vendor.